These six papers were originally delivered to a conference at Sheffield University in 1969 and represent an overview of a research project led by Professor Pollard, which aimed to construct a series of annual figures of capital formation for the Industrial Revolution in Britain - both in aggregate and broken down into main sectors. Each paper is accompanied by a summary of the discussion which followed. 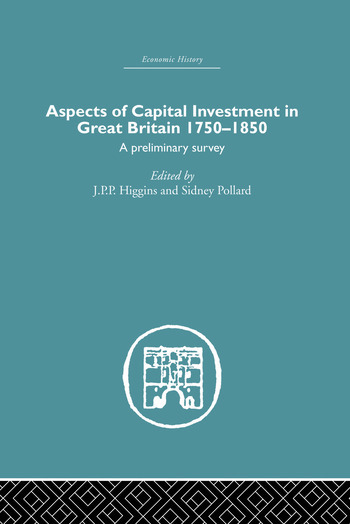 The problems encountered in such an undertaking are examined, a major one being definition: what to include in the term 'capital', how to measure or isolate expenditure under that heading, and how to deal with changes which have made the definitions and practices of present-day national income estimates inapplicable to earlier centuries. Sources are also examined in depth as statistical information is not only uncertain and often unreliable, but of different value and completeness for different sectors of the economy. 1. Modern Practices and conventions in measuring capital formation in national accounts, J. Hibbert. Comments by F.M.L Thompson and A. Harrison.